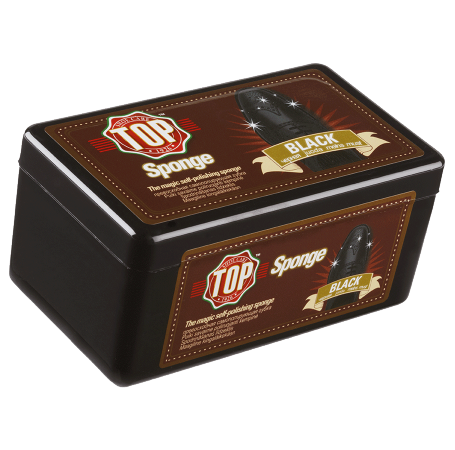 The self-polishing sponge soaked in refined silicone oils, with the addition of waxes and special pigments not only polishes instantly but also revives the colour of footwear and objects in smooth/polished black leather. Notes: The first and unequalled (over 60% market share). The most widely distributed. Product synonym. Quality of the selected oils. Longer-lasting. Smooth grip that does not scratch the shoe. Colour intensifier. This product is also available in neutral and suede. Take the sponge from the cardboard box without throwing it away (it will be useful in the future for keeping the product properly and recognizing it immediately). Remove the sponge from the transparent tray and pass it over the shoe leather with medium pressure. The shoe will become clean and shiny immediately, and its colour will be brighter. Black smooth or polished or "closed-grain" leather, glazed, brushed, printed, eco leather. Suede, untreated light or "open-grain" leather, nappa, leathers with colours other than black, nubuck, peccary, alcantara. Calzanetto leather super-polishing treatment, it acts thanks to the gradual release of the refined blend of silicone oils contained in the sponge. Absolutely harmless for leather, it deposits a protective layer on it which confers shine, softness and slight waterproofing. The brightening version, enriched with waxes and pigments, confers greater intensity to the basic colour.